It’s here! 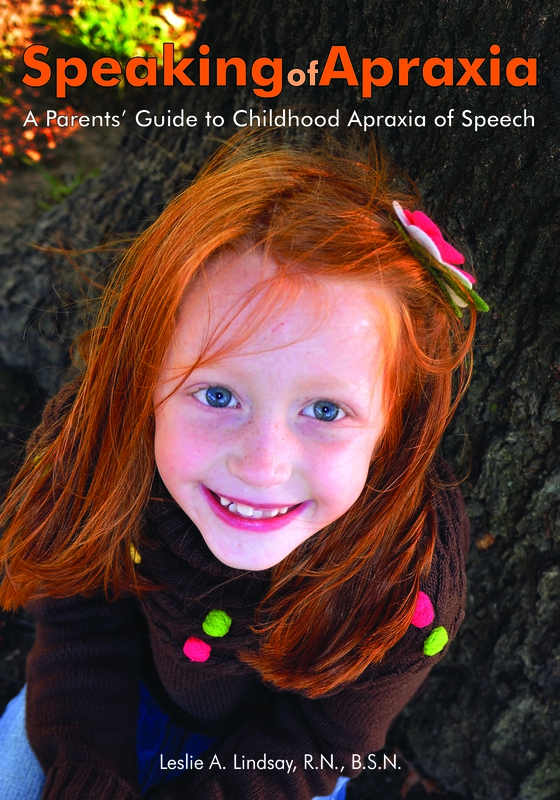 After nearly 4 years from conception to completion, “Speaking of Apraxia: A Parents’ Guide to Childhood Apraxia of Speech” was released from Woodbine House in late March 2012 (www.woodbinehouse.com). What the Book is About: A comprehensive guide to understanding, treating, and living with childhood apraxia of speech (CAS). Written by a parent for parents, this book will give you a good understanding of what CAS is and how you can make the most of it for your child and your family, all written in a simple, down-to-earth, almost “folksy” style (with some boring, scientific details). Who Should Read it: Parents, grandparents, early-ed teachers/preschool, elemenary teachers/educators, pediatricians, speech-langauge pathologists, occupational therapists, reading specialists, non-profit groups, those affected by other special needs such as Austism and Down syndrome, and anyone else who cares about a child with CAS. Why I Wrote this Book: Not for fame or glory, that’s for sure! Writing is hard work. Writing about a complex speech disorder, really hard work! My first motivation for writing this book was simply that I wanted a book when my daughter was diagnosed with CAS (that’s her on the cover). I found some decent websites out there, but was overwhelmed with the “sorting through and weeding out” to find the answers I wanted. Plus, there were questions that I just couldn’t find answers to on the Internet. I located and read old text books in the field of speech pathology, connected with parents, SLPs and researchers, attended conferences, and facilitated my own in-person group on the subject: Small Talk All About Apraxia. All the while, I was parenting a daugher with CAS and getting valuable insights of my own (and hers!) along the way. A writer at heart, I came to a better understanding of my own feelings regarding the disorder and gained a better grasp on the subject at hand while writing and researching this book. Call it an unconventional coping method, but that’s exactly what it did: writing helped me cope with my daughter’s diagnosis while giving others a little piece of hope. I hope you will find the book helpful and hopeful, for that is my goal. “Hi Leslie – I just got your book today from Amazon. I have read the first fifteen pages and I’m in tears. I can’t wait to read the rest (but I have a three year old and a nine month old so it won’t be until later today!) ….just wanted to say thanks for writing this book. I can’t wait to read the rest but I wanted to reach out to you. I’m sure you will hear this from many.” –L.K. “Hi Leslie, I was so excited to open up my Advance for SLPs magazine today and see your book advertised! (and I thought you would like to know that people are seeing it!). So exciting! Your ‘baby’ is out there. I wish you lots and lots of success with it!” –R.W. “Your book arrived and I read it in its entirety last night 😉 Now if I can just get a review written and submitted. Bravo! Loved hearing your story and know that this book will help so many others with so many of their questions. My favorite parts are where you reference children’s books or movies that you have read or seen that remind you of struggles with speech. We plan on watching Charlotte’s Web and I am searching for my copy of Knufflebunny.” –M.C.T. “I could feel your blood, sweat and tears as I flipped through the pages (wiping my eyes).Outstanding! I just shook my head in amazement………….I am in awe and I am still kind of speechless…..really! This book will be just one of your legacies…..
“A huge thank you for SPEAKING OF APRAXIA. I am loving this book….only wished I had it sooner. I love all of the tips and resources. We even have an appointment with Nancy Kaufman now. I feel like we have some direction. Thank you.” –Mother E.D. “Cole’s confidence has grown and grown. I want to thank you Leslie over and over from the bottom of my heart for what you have given my family that brings me to tears.